IPOH Feb 2014 : There has been an alarming increase in the number of foreigners encroaching on state forests and stealing precious wood, says the Perak Forestry Department yesterday. 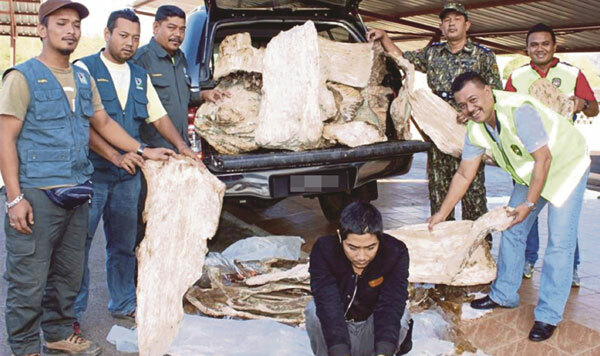 Its director, Datuk Roslan Ariffin, said 10 foreigners and two locals were nabbed trying to smuggle gaharu from the Royal Belum State Park in three incidents recently. Vehicle loaded with agarwood grade B and C which was estimated worth RM500,000 wood stolen from forest Royal Belum. In the second arrest on Saturday, a foreigner driving a four-wheel-drive was caught in Jalan Timur Barat Gerik-Jeli at 4.30pm. On the same day, seven men, including five foreigners, were arrested in Bersia, Gerik, at 8.30pm. 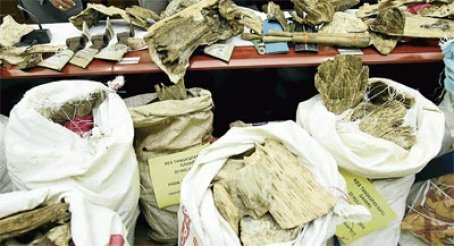 “All suspects are aged between 25 and 35, and the gaharu seized are worth RM2 million,” Roslan said, adding that the total amount of gaharu seized were 400kg. Part of the 400kg of ‘ fragrance wood‘gaharu’gaharu’ worth RM2 million seized by the Perak Forestry Department. Roslan urged villagers staying near the forest areas to be the department’s eyes and ears to keep such illegal activities in check. My personal point of view, having judged on the photo, the wood will never ever bid for such high of price. These woods are of lower incense grade, or better still go into distillation pot. Most probably the confiscated woods could be open for public auction at much higher price…. but who wants them? or officers will be rewarded higher bonus end of the year for their hard work in protecting the natural resources. This entry was posted in Agarwood thieves. Bookmark the permalink. I want to buy agorwood for resale in india.how could i help from your site.just suggest me.